In 1985, I took a Jubilee Sailing Trust voyage on STS Soren Larsen. I was a timid person, awkward with cerebral palsy, and when I returned to my dull office job, I must have bored the pants off my colleagues with my recounting of a holiday that had filled me with high achievement, confidence and laughter. Dangling from the bow sprit, doing the ‘graveyard’ watch of the night, cleaning the brasses, taking a turn at the helm, the magic of esprit de corps, were things to be savoured and relished for a lonely 32 year old whose life consisted of just work, home and housework. But the holiday was a turning point and had given me something precious, CONFIDENCE. It had also given me a friend for life. Jan, a music teacher from Wivenhoe, Essex, where the Lord Nelson (the JST’s flag ship) was being built, had been my buddy for the voyage (buddies were working partners that the permanent crew assigned to you at the start of the voyage). Now, I was travelling to Wivenhoe regularly to visit her from my home in Redhill, Surrey. Eventually, I found I had more friends in Wivenhoe than in Redhill. My tedious job was getting me down; I had to do something! So, I quit the job, sold my flat and moved to Wivenhoe to start afresh as a mature student. That voyage in August ’85 had instilled in me a sense that I could do anything, if I tried. Even to the point of changing the direction of my life. Since then I’ve hit many a choppy water. I am 65 now, weaker and frailer than I was back then. I have fractured my neck and I now walk with a walker. But I haven’t given up on new challenges. 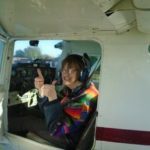 Last year, I took up flying! On doctor’s orders I can only take the controls at cruising level only, but that was good enough for me! I have a pilot’s log book with 10 hours recorded on it. The Cessna aircraft has dual controls so, with an instructor on board, it’s perfectly safe for someone with L plates on to fly. So when the JST issued their challenge to branch members to raise some much needed funds for their two ships in this their 40th year celebration, I jumped at the chance to say a big flying THANK YOU to the JST. So, when the Lord Nelson voyages near the North Essex coastline during the Southampton to Sunderland week starting 7th July, I am aiming to do a sponsored victory roll in the skies over her, weather permitting, of course. Having just obtained the clearance from my flying doctor to do gentle aerobatics, and with the consent of the Clacton Aero Club, I feel confident I can do this challenge – alongside my instructor pilot of course! For those who don’t know, the Lord Nelson is the flag ship of the Jubilee Sailing Trust, a unique charity whose ethos of equality at sea is central to their operation. Commencing building in 1984, she was one of the last orders from the James W. Cook shipyard to be built, and arose from the marine architect’s plans as a vessel dedicated to scattering the perceived idea of the time that sailing was only for the fit and healthy. Thousands of testimonies now bear witness to the dream, in 1978, of a remarkable few enlightened people, led by Christopher Rudd, that proves the fulfilment of that vision. Many thousands of lives have been changed for the better by this beautiful square rigger, designed to embrace the needs of the sight impaired, the hearing impaired and wheelchair users. Attitudes to disability and people with disabilities have been changed forever as prejudice and intolerance have given way to understanding and compassion. For the working of a ship demands teamwork. As I found out back in 1985, on the pilot scheme using the brigantine Soren Larsen, the practice adopted by the Jubilee Sailing Trust was to twin able bodied voyage crew with their physically handicapped counterpart (their buddy) to work the ship. What one person can’t do, another person can. I have cerebral palsy and with pulling the ropes I was pretty ineffectual, and trying to peel potatoes was a nightmare – half the spuds shot over the side, (if there had been a Cutter boat in sight it would have been chips for tea!). But I worked alongside others to restore the ropes to the belaying pins and shared polishing the brass in happy hour. Along with many others, as I worked, my confidence and self-esteem grew. And when it was time to return home, the whole experience gave me a spring in my step and a feeling that I could do anything! With the new purpose built Lord Nelson in operation, wheelchair users could access most parts of the ship, even the crows nest was accessible by hoist. Seeing someone hauled up the rigging was a common sight. In 1994, with gritted teeth, I achieved my own climb up to the crows nest. I sprawled out on the deck for a long time afterwards, sheer elation uppermost from total exhaustion. But now I was happy; I had accomplished something extraordinary that I didn’t think I had the courage to do. This year marks the 40th anniversary of the founding of the JST. In July, the Lord Nelson has a week long voyage up the east coast of England from Southampton to Sunderland, starting Saturday 7th July. It would be wonderful if somehow Wivenhoe could mark the anniversary by sharing time, in some way, with the crew of the ship that was built here, admired all over the world, and is commemorated by the new apartments where Cook’s shipyard used to stand. Unfortunately, Nellie (as she is affectionately called) would never be able to sail to Wivenhoe now as the river is silted up. However, with a bit of effort and determination, surely if the ship can’t come to Wivenhoe, then a touch of Wivenhoe can go to the ship; as this article goes to print, this idea is being considered by the JST. In recent years, Lord Nelson has covered 52,577 nautical miles and 60,482 land miles just with her epic voyage around the world alone. From this, JST operations are now covering Australia and New Zealand. Along with her sister ship, Tenacious, Lord Nelson, within the last three years, has delivered exceptional, often life changing, adventure experiences to over 7,840 sail trainees (voyage crew). Of these, 2,800 were disabled. Included were: 630 wheelchair users, 677 with sensory impairments, 105 with epilepsy, 518 with learning disabilities or mental health issues. It costs the JST £200, per person, per day, to run their sailing programmes. They are reliant upon two sources of income: one from the sale of places on their voyages, and two from fundraising. Help is available for those who can’t afford the full voyage price.